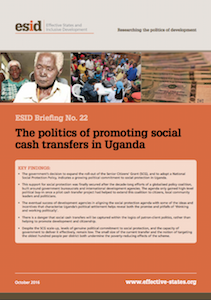 The promotion of social protection in Uganda has been a highly political affair, closely shaped by political dynamics involving the perceived interests of the ruling coalition in securing its stability and legitimacy. The government’s shift away from the poverty reduction agenda towards a focus on ‘prosperity for all’ and structural transformation in the mid-2000s seemed to reduce the space for pro-poor policy-making, including on social protection. Although social protection has again risen up the policy agenda in Uganda in recent years, much higher levels of commitment and capacity will be required if it is to become an integral part of the government’s development strategy and to achieve lasting gains for the country’s poor and vulnerable people.